I have noticed the somehow famous Qian Li Xiang 千里香 bak kut teh from Klang had opened a branch here in USJ 1 recently but never had the chance to go for a meal there. So after me and Ming finished our happy hour beer(s) near the place I've decided to bring him there. The place is easily located if you are familiar with USJ 1, I will explain how to go there later on. The atmosphere was very nice, and very modern at the same time. But being too hungry and a little drunk I forgot to take pictures for the interior...stupid! 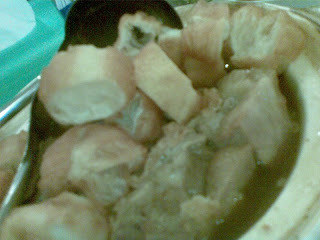 We ordered bak kut teh with pai kut 排骨 & pig stomach and some cabbage 包菜 with oyster sauce to go with it. They offer other dishes such as asam fish, pig stomach soup & abalone...but I'd rather stick with just bak kut teh...the way i like it...JUST bak kut teh...lolz. 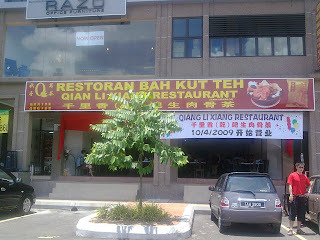 The dish was quite decent, must say one of the better ones outside Klang. soup was almost on par with Klang standards...however something was missing...maybe the "old" taste of this famous dish only found in Klang...nonetheless it was very enjoyable. The veg was not too bad. Quickly stir-fried with a generous load of oyster sauce on them. 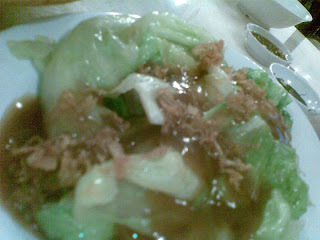 The cabbage was crunchy and provides a very nice change in texture when you are biting into the soft tender pieces of pork. We had a very good meal there, and i must say i was pleasantly surprised that the food here is actually comparable with the real deal in Klang. Definitely would drop by this place for weekend bak kut teh sessions on those rare occasions when i couldnt wake up for morning bak kut teh sessions in Klang. Heres the map for you readers. coming from ss13 Subang Jaya, turn left at the traffic lights after Summit. Then turn right on the next set of traffic lights. Qian Li Xiang is on your left, located in one of the newly built shoplots. 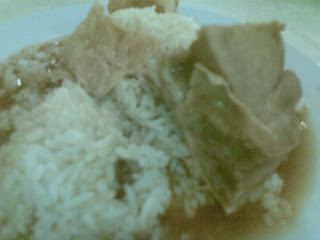 Doggyjames says...Definitely must try for all bak kut teh lovers who just cannot wake up in time for the real deal in Klang.